DREAM on Sunday held its second event in two weeks at the Saitama Super Arena in Saitama, Japan before 21,789 fans in attendance. DREAM.3 was highlighted by the second round of the DREAM Lightweight Grand Prix. In the upset of the night, Caol Uno submitted tournament favorite Mitsuhiro Ishida in an entertaining affair. Uno stuffed Ishida’s early takedown attempts, tagging him with punches and stunning him on several occasions. Ishida began to bleed profusely from his nose, unable to get the fight to the ground. As the fight unfolded on the feet, Ishida began to land some strikes, but it was clear that Uno was still getting the better of the exchanges. Ishida finally scored a takedown towards the latter stages of the first round and secured Uno’s back, but was unable to sink the choke as Uno reversed out as the round ended. The second round began better for Ishida, who was able to get the fight to the ground right off the bat. A scramble ensued with Uno securing a rear naked choke without the traditional hooks in, but Ishida tapped out none-the-less at 1:38 of the first round. 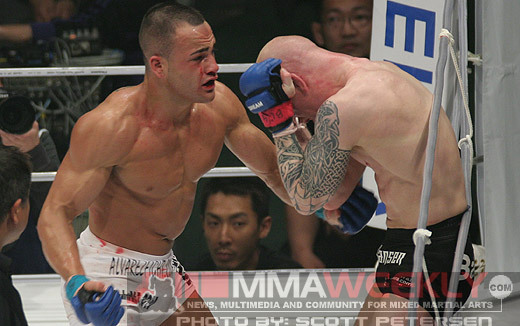 Eddie Alvarez and Joachim Hansen engaged in a fifteen-minute war, in what will be considered a fight of the year candidate. They began trading early with Alvarez dropping Hansen, who stayed composed and attempted an armbar before making his way back to his feet. They began to trade again, with Alvarez again stunning Hansen, getting on top of him on the ground and dropping punches. Alvarez mixed in his crisp striking with wrestling, getting several takedowns and controlling the opening round. The second round was much closer with Hansen finally finding his range on the feet, tagging Alvarez with combinations. Alvarez continued to take Hansen down, but was continually threatened with armbar attempts. 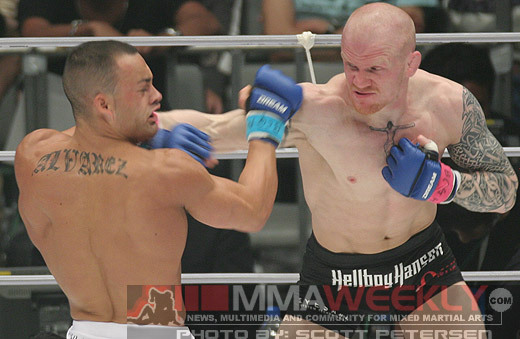 Hansen nearly secured the lock on several occasions, but Alvarez managed his escapes. As the fight came to a close, Alvarez landed a high kick and the bell rang as the two were trading blows. Hansen made the fight close in the second round, but Alvarez walked away with the unanimous decision and a spot in the semi-finals of the Lightweight Grand Prix. Tatsuya Kawajiri also moved on to the semi-finals of tournament, pounding out a decision over Luis “Buscape” Firmino. Buscape tried his best to score a takedown, but Kawajiri defended well, putting the Brazilian on his back. From there Kawajiri would unleash a barrage of ground and pound. Back on their feet, Kawajiri dropped Buscape with a combination and continued his ground and pound attack. The second round played out much like the first with Kawajiri stuffing Buscape’s takedown attempts and ending up on top, then unleashing his ground and pound assault. Buscape’s only bright spot in the fight came towards the end when he secured Kawajiri’s back, threatening with a choke. Kawajiri, however, reversed out and ended the fight with a barrage of strikes, securing a unanimous decision. 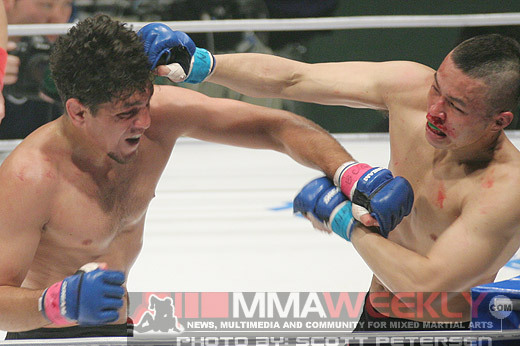 Following a week of being on the fight card, being removed, and then being added back in at the last minute, the always controversial Nick Diaz returned to action against former welterweight King of Pancrase Katsuya Inoue in a title eliminator for the DREAM welterweight title. These two traded blows for the duration of the bout, with Diaz landing the crisper and more powerful punches, bloodying Inoue’s nose early in the fight. Inoue was game, returning fire with combinations of his own, but not finding the same success. After a restart, Diaz turned up the heat on Inoue, landing a series of stinging punches that had him staggered and out of the fight. Diaz continued to land unanswered punches until Inoue’s corner threw in the towel, stopping the fight at 6:45 of the opening round. In an entertaining lightweight contest, U-File Camp lightweight Daisuke Nakamura knocked out 2000 Olympic Judo silver medalist Bu Kyung Jung. They exchanged submission attempts in the first round with Jung almost locking in an armbar. Nakamura escaped and an entertaining ground battle ensued with Nakamura going for armbars, kimuras and heel hooks. The second round started with Nakamura attempting a standing kimura then transitioning to an armbar once they hit the ground. Jung escaped and got back to his feet. Back on their feet, Nakamura landed a stinging right that knocked Jung down, finishing the fight with strikes at 1:19 of the second round. Dutch striker Melvin Manhoef survived early trouble to stop Korean judoka Dae Won Kim. Both fighters started tentative, sizing each other up before Kim attempted to get the fight down on the mat. Shortly thereafter, they began to trade punches with Kim getting the better of the exchange and then taking the fight to the ground. After some struggling, Kim attempted a triangle choke, but Manhoef escaped, landing in side mount and ending the fight shortly thereafter with a devastating knee and following it up with punches until the referee stepped in at 4:08 of the first round. Jason “Mayhem” Miller advanced to the second round of the DREAM Middleweight Grand Prix – this was the final bout of the middleweight tournament’s opening round – thoroughly dominating former Japanese pro wrestler Katsuyori Shibata. Miller seemed to be toying with Shibata throughout the fight, leaving his chin out and getting tagged with some punches before taking the fight to the ground. From then on, Miller dominated Shibata tagging him with punches and knees, mixing in an armbar attempt, which Shibata escaped. The end came midway through the round, when Miller in full mount, rained down punches until the referee finally stepped in to save Shibata from further punishment at 6:57 of the first round. 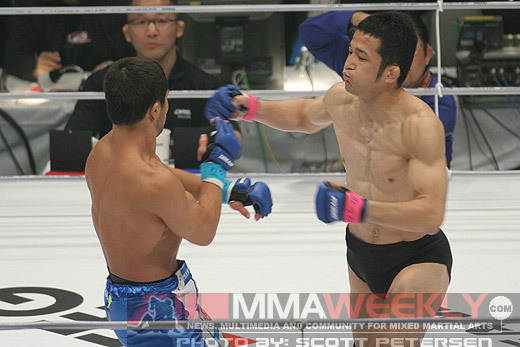 The featherweight division made its first DREAM appearance, when DEEP veteran Takeshi Yamazaki faced off with lightweight King of Pancrase Shoji Maruyama. Maruyama started out the fight in the air, partially landing a flying knee on Yamazaki, who immediately took the fight to the ground. 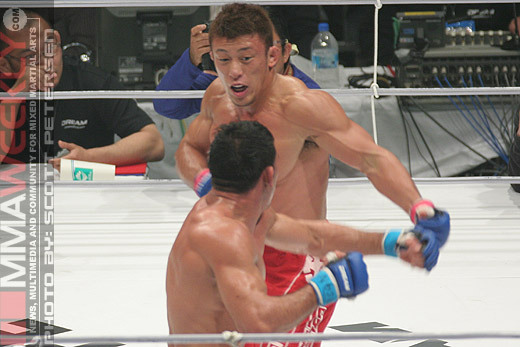 Yamazaki would control Maruyama with punches and submission attempts, as Maruyama fought back with stinging punches of his own from the bottom. Yamazaki nearly ended the fight towards the end of the opening round, locking on a tight armbar that looked to have the fight finished. Maruyama somehow escaped, however, and made it out of the round. Yamazaki employed the same strategy in the second round, taking the fight to the ground and avoiding Maruyama’s dangerous stand-up. Maruyama did land one strike, a stinging high kick that hurt Yamazaki, who immediately took the fight back to the ground. In the end, the judges were impressed with Yamazaki’s ground control, awarding him the unanimous decision.